Pacific Beach San Diego is one of the most popular beaches of San Diego, running from Crystal Pier south for about two miles before it becomes Mission Beach. If you want to be where the action it, Pacific Beach or just P.B. as it is called by the locals, is the place to be. Stay at one of the nearby hotels in Pacific Beach to have a great time. The long, narrow cement Pacific Beach boardwalk lines the beach and is full of skateboarders, rollerbladers, runners and bike riders. 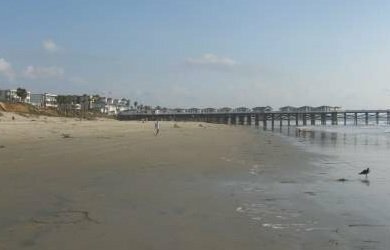 The boardwalk extends for three miles down to Mission Beach. This is a favorite place for college students from UCSD and SDSU, and young adults to exercise and have fun. There are many interesting shops, restaurants, taco stands, and beach rental stores, especially at the northern end close to Grand Avenue, to enjoy on your Pacific Beach San Diego vacation. Parking: Limited 4-hour free parking at end of Grand Avenue. In general, parking is scarce, look for other small parking lots and street parking as available. Getting There: Short walk to the beach from parking areas. Also the long Pacific Beach boardwalk stretches from Mission Beach to Pacific Beach and offers great access by bicycling, roller blading, and jogging. Things to Do: Walking, jogging, roller blading, sunbathing, swimming, bodyboarding, surfing, fishing, beach fires in firepits, shopping, partying at local bars. Things to See: Young people at the beach, sunset over the Pacific Ocean, Crystal Pier. Facilities: Restrooms (at Pacific Beach Drive and at Grand Avenue), showers, changing rooms, trash cans, concrete Pacific Beach boardwalk along the beach. Lifeguard: Lifeguards during summer at multiple locations, and main station at Grand Ave. during winter. Things NOT to Do: No alcohol (also includes no drinking on the nearby boardwalk, parks, or parking lots), no glass containers, no smoking, no littering, no disturbing noise, no overnight sleeping, camping or parking. Hazards: Rip currents, noisy parties at hotels and bars just off the beach and boardwalk. North Pacific Beach lies north of Crystal Pier and stretches up to Tourmaline Beach. It is a quieter section of SD beach, more popular with families. Looking for some Pacific Beach hotels? San Diego offers many beach front rentals, hotels, and vacation rentals in the area of Pacific Beach California, ranging from quaint bungalows to upscale modern hotels. 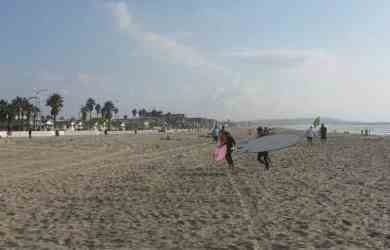 If you are looking for a condo or vacation rental in Pacific Beach Calif., there are many local vacation rentals. A rental a few blocks away from the popular hotels will be a quieter choice. If you are looking for the San Diego beach experience with a young and energetic crowd, a hotel on or near the beach in Pacific Beach or PB is the place to be. Here are some suggested hotels in Pacific Beach. Tower 23 Hotel San Diego in Pacific Beach San Diego, is a contemporary designed hotel that offers room types shows the essence of the hotel: spirit, sky, surf, sanctuary and sweet. Try the in-room couple massage, or sit on the Tower23 deck and listen to the ocean breeze, watch the surfers or enjoy the sunset. The Tower 23 hotel is a great romantic San Diego hotel with a spectacular view of the Pacific Ocean and Crystal Pier. No swimming pool, but you are right on the beach. Lots of places to walk to and many local restaurants and bars, such as Kono’, 710 Beach Club Cass St. Bar and Grill for beer. This is a modern Pacific Beach hotel in San Diego and a great place to stay for a perfect Pacific Beach vacation. Best Western Blue Sea Lodge is one of the hotels in Pacific Beach, San Diego, CA that makes a great beach getaway. With an oceanfront pool, great sunset views, Pacific Beach boardwalk, nearby restaurants and nightclubs, you have everything you need for some family fun in San Diego, or some exciting nightlife in PB. This is a great hotel in Pacific Beach San Diego. Ocean Park Inn at Pacific Beach is one of the many Pacific Beach hotels in San Diego. It is right on the beach and has a swimming pool, spa, massage therapy and continental breakfast. 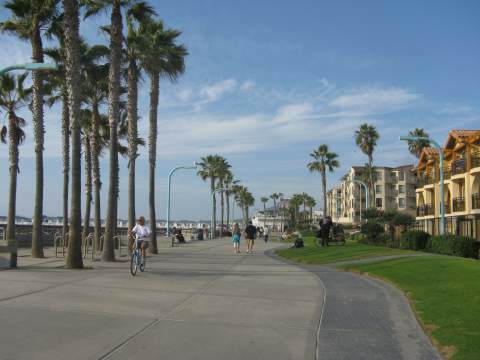 You can rent bicycles and enjoy the boardwalk, and of course enjoy the wonderful Pacific Beach and San Diego beaches. You can walk to the nearby restaurants and bars in PB. Non-smoking. No pets. Driving Directions to Pacific Beach San Diego: From Interstate 5 go west on Grand Avenue toward the Pacific Ocean. There is a small parking lot at the end of the street with 4 hour parking, or several 15 minute unloading zones. Additional parking is available on the side streets north and south from that location. Directions to Pacific Beach from Mission Beach: From Mission Beach, you can walk, roller blade, skateboard or bike ride along the cement boardwalk that goes from Mission Beach to Pacific Beach.